The Selle Royal Avana saddle has been designed with comfort in mind, and a couple of special features for folding bikes. The Selle Royal Avana has been designed for use with folding bikes. There's an ergonomic protector grip under the nose. 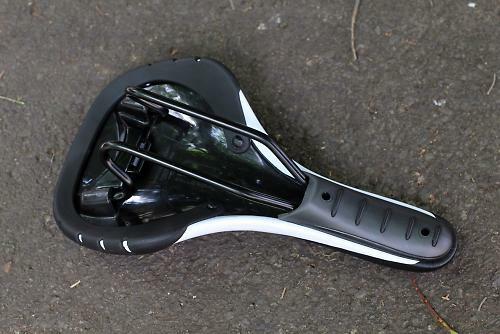 You also get Selle Royal's Integrated Clip System, as found on sister brand fizik's saddles. Pop the clip out and there's a slot for a rear light or saddle bag. Quite nifty. The Avana is designed for a riding position with a 45-degree back, in keeping with the 'comfort' designation. It's more of an upright position which will suit the way commuting riders typically sit on the bike. It isn't specifically designed for male or female riders, pitched in the middle as a unisex saddle. Fitting the saddle is straight forward, the large rails make this easy. They are also very flexible, this also allows the sides of the saddle to bend or move quite easily, again providing a comfortable perch. Even on the nose there is some give which makes for a more relaxed feel even over the rough stuff. Everything about the Selle Royal Avana has been designed with comfort and flexibility in mind. It's all about providing a seat you can rely on that will keep on making life easy on your backside irrespective of how far you want to ride. Having got used to a narrower seat the Selle Royal Avana felt odd to start with. It just felt too wide and bulky. But that's an individual preference, there is no denying though it is comfy. If you're looking for a saddle that takes the pressure off your rear then the Avana may be the end of your search. Wide enough but with enough flex to prevent any unnecessary pressure on the inside of your thighs. The railing design enhances the sense of comfort further still, even over the rough stuff. Aimed at the recreational rider who is after a more relaxed seat offering flex and give rather than a solid saddle. It did raise an eyebrow when I first felt it and picked it up. It was larger and heavier than I'm used to but having got over my initial reaction the Avana felt exactly what it is, a comfortable seat that gives you the support you want, in the areas you want it. The foam matrix open cell structure provides increased elasticity and breathability to guarantee a durable and comfortable saddle. This is exactly what you're after, and the quality of the Avana is good. There is little to fault in how the Avana has been put together. The foam structure used is robust and easy to wipe. The integrated clip that pops out to allow you to fit Selle Royal's range of lights or bags is a neat touch. The 7mm railings are also solidly made and make for a firm platform. If it is comfort you require then the Selle Royal Avana is certainly one saddle that will give you plenty of support whilst allowing you to keep an upright position to keep you relaxed. The materials used in the construction of the Avana have been robust and the saddle covering is easy to wipe down in the event it gets any dirt or marks on it. The amount of cushioning added to the Avana mean that there has to be some penalty. It can't give you this amount of flex, comfort and not pay a price. This comes in the weight as at 380g it comes in the heavyweight category in comparison to typical road saddles. Despite the comments above, all that will be forgotten if you're in the market for a seat that allows you to spend hours on it if you wish. The amount of give in the sides and even on the nose make for a pleasant seat. All this for £34.99 represents good value. That's a lot of comfort for the money. Any rider after a large but comfortable saddle will not be disappointed by the Avana, as long as you don't expect a featherweight. Getting over my initial impressions the Avana provided a comfy perch. The weight penalty and the position is too upright for me. Did you enjoy using the product? Surprisingly so, yes. Would you consider buying the product? Not my riding position. Would you recommend the product to a friend? If they were in the market for a comfortable commuting saddle, then yes. The Avana provides comfort and flex in all the right areas but don't expect this to be a lightweight affair. You pay a price for this but this will provide ample comfort on long, bimbling rides - not for racers.